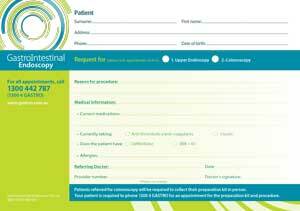 GIE accept both electronic and paper referrals for patients requiring our Open Access endoscopy service. The electronic template is available for Medical Director (MD), Best Practice (BP), PractiX, Zedmed and Genie programs. Please see below, the GIE referral templates and the instructions required to import the forms into your clinical program. Please remember to SAVE the template to a folder or to your desktop prior to opening the template. PLEASE DO NOT OPEN IN MS WORD. If you would like our Marketing and Business Liaison Officer to visit and import this template for you, please call one of our four locations and leave a request. If you are requiring A5 referral pads, please contact one of our locations for delivery of our forms to your practice, or please print the Referral Form here. Alternatively you may use this pdf of the GIE referral template pdf (please ensure all information recorded appears on the printout).